I genuinely do not miss eggs as a vegan, and a major reason is that I’ve experimented and perfected my favorite vegan breakfasts. 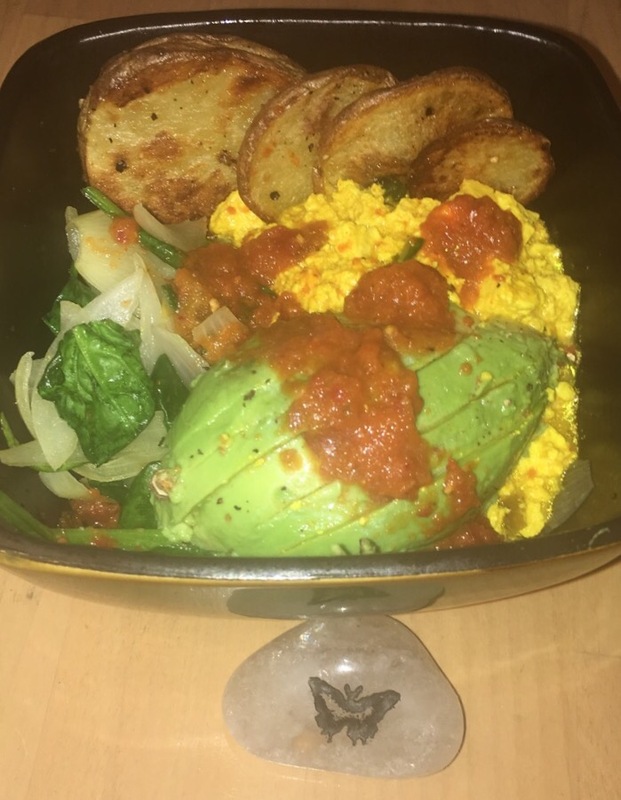 I am often asked how I cook my tofu scramble, and after lots of trial and error, I wanted to share my favorite recipe and cooking process that I’ve developed. I hope you enjoy this as much as I do! *Proportions can be modified to taste. 🌱Preheat oven to 400 degrees. 🌱Slice potatoes into circles. In bowl, evenly toss potatoes in salt and pepper. 🌱Pour “tofu guts” into a medium saucepan. Crumble extra firm tofu and place in the pan, turning on medium heat. 🌱Add turmeric, garlic granules, basil, nutritional yeast, salt and pepper to pan. 🌱Once “tofu guts” water has started to cook away, add a dollop of salsa to the scramble mix. 🌱Slice onion. Add to sauce pan with a little water. Cook over medium heat until onions start to caramelize. Add spinach, and top with salt and pepper. 🌱Cut avocado in half. Spoon out green avocado onto a cutting board. Sprinkle pepper. Cut into slices. 🌱Pour finished tofu into two bowls. Add spinach and onion mixture divided evenly to both bowls. Dress with slices of potato, avocado slices, and finish with Kimchi Sriracha. I love this Sriracha since it tastes amazing, and adds probiotics to any meal to help aid with digestion and support immunity.